Welcome to our Maravilla 2403. Awesome views await you at Maravilla 2403's direct gulf views. Updated kitchen with new granite counters and stainless appliances. King Master bedroom has sliders to balcony and private full bath. Queen Guest bedroom has full bath directly across from bedroom. Flat screen tv's in livingroom and all bedrooms. Sliders to balcony from livingroom and master bedroom. New upgraded balcony furniture including lounges with plus cushions. Outdoor amenities include 2 pools, tennis courts, fitness room, hot tub, large private beach, barbecue grills at both pools. Maravilla is a gated community with lots of greenspace, ample parking. Maravilla 2403 is pet friendly for your convenience. Complimentary 2 lounges and beach umbrella service for entire stay. Walk to Pompano Joe's, Captain Dave's and Kenny D's Restaurants. 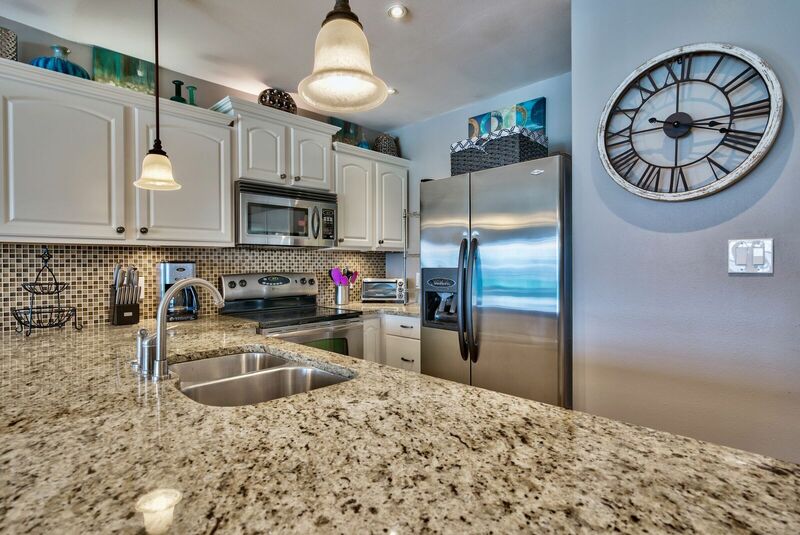 Close to Silver Sands Outlets, Destin Commons, Harbor Walk Village for dining, shopping and entertainment. Destin Harbor has fishing and water sports for your enjoyment.